It’s so exciting to look forward to all the fantastic events happening for Katie Alice Floral Design this year. The wedding Flower diary is filling up fast, its so exciting hearing all about the happy couples upcoming wedding days and creating flowers to complement them. Wedding Consultations are filling the diary up so get booking yours today! I can’t wait to have the privilege of working in so many of the fantastic wedding venues all over Leicestershire this year. The first week back has been a busy one in The Flower Barn, Rothley. 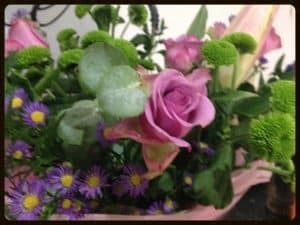 The Katie Alice Floral Design van has been nipping around Rothley, Swithland, Mountsorrel and Quorn offering free local delivery on all floral bouquets and arrangements. Remember folks it’s not long until Valentines Day!! Ill be getting the red roses out soon!! !